I’m on Packerland Drive in Green Bay at the corporate headquarters of Schneider National, a transportation firm with lots of orange trucks, for the monthly meeting of the NE Wisconsin chapter of the Public Relations Society of America. Here are the slides I used for my presentation, which was entitled Not Your Father’s Media (Yet). Comment on the presentation in the post below, and ask any questions we didn’t get to cover. Join Facebook and “friend” me. Sign up for Twitter and “follow” me. Sign up for Google Reader, take the tour, and subscribe to some RSS feeds (including SMUG’s). If you want it by old-fashioned e-mail, get that here. Enroll in SMUG by joining the Facebook group. This should all maybe take another 30 minutes or so to get started, but it hopefully will launch you on a lifetime of social media exploration. 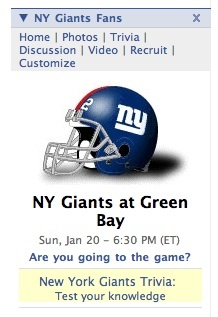 Being from Minnesota, it’s fun that on Facebook I can jab my Cheesehead friends by adding the NY Giants Fans application, as my sons Jake and Joe have.